No one likes dealing with the common cold, and yet, it’s an ailment that often finds itself resurfacing in our lives despite our best efforts to keep it at bay. In fact, the average adult will develop anywhere between two to three colds per year according to the Center of Disease Control, while children are twice as likely to catch a cold than an adult. So how long does it take to get over a cold and, furthermore, why is it so easy to get a cold in the first place? We’ll cover both of these questions and more throughout this article to keep you armed with the knowledge you’ll need to keep the common cold at arm’s length. It’s best to start off asking this question if you want to know how to avoid catching a cold virus. The most important fact that may shock you is that the common cold is more than just a single virus, in fact, the common cold is made up from over 200 different viruses that mutate and change between each host. However, the most common culprit which takes up over half of the blame for our discomfort is the Rhinovirus, a virus that attacks the nose and throat. This virus starts by attaching to the lining in your throat and nose. Your body will recognize the threat immediately and start sending in the immune systems defense force, or white blood cells, to take care of the intrusion. Unless your body has come in contact with the same strain of virus before, which is unlikely, this first wave of attacks will fail. Your body will then send more reinforcements while your throat and nose start to inflame. Mucus will begin to overproduce due to the inflammation, and all this action your body takes to kill off the cold will leave you tired and miserable. The cold affects more than three million people every year, mutating between each host which makes it harder to defend against it. While the cold usually spreads easily in winter and spring, that doesn’t mean you can’t catch a cold during summer or fall. If you smoke, suffer from seasonal allergies, remain in close contact with other people often, or even deal with stress, you’re at a heightened chance of catching a cold from someone else. What Are the Common Symptoms Of The Cold Virus? Within three short days of coming in contact with the cold virus, you could be experiencing the first few signs that you have a cold. It could start out as a tickle at the back of your throat or repetitive sneezing that go beyond day-to-day allergies. Even more than typical fatigue can be a sign that your body is trying to fight off a cold. Generally speaking, it won’t be hard to determine that you, in fact, are sick. If you’re feeling any of these symptoms listed below, it could mean that you are experiencing a cold. Colds are spread from person to person with relative ease, spreading through fluids that contain the virus. These fluids can come from drinking from the same glass as an infected individual, talking with someone, or being in range when someone sneezes. If droplets enter your mouth or nostrils, you could contract it which is why it’s so important to find a way to cover your mouth when you sneeze. Coming in contact with contaminated surface areas such as public restroom doors, counters, money, or even table surfaces can get you sick. 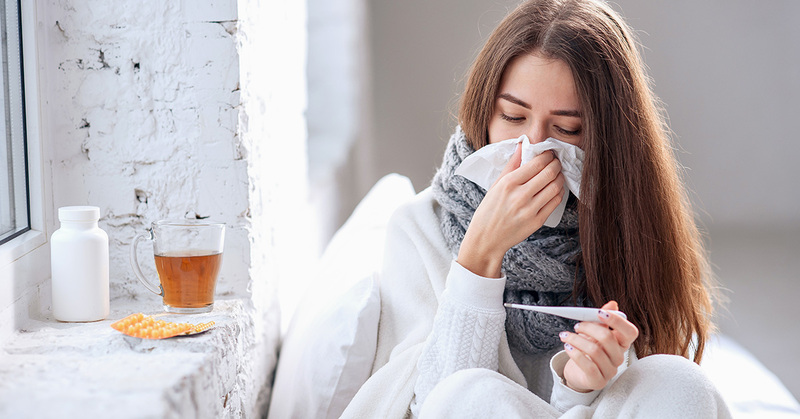 What makes this worse is that the rhinovirus is better at reproducing in colder temperatures than other viruses that cause the cold, a trait that gives the rhinovirus a considerable advantage during colder months. That’s the question that everyone asks when they begin their dreaded descent into warm comforters and a mountain of used tissues. For an average, healthy, adult the common cold can last anywhere between seven to ten days. Individuals who have a compromised respiratory or immune system may take longer to get through the cold and are at a higher risk of developing pneumonia if they aren’t careful. Symptoms of the cold virus start off minimal, reaching its apex at about the four-day mark before slowly tapering off by day seven. If your symptoms seem to worsen or linger longer than ten days, then it might be time to see a doctor about treatment. Usually, this is a rare event, but as cold viruses mutate in each host, getting rid of them can get harder to do; This is especially true for individuals who are over the age of sixty-five and children. A cold virus that lingers too long in your body can lead to upper respiratory infections and even pneumonia, also occurring in the sinuses and ear canal. At this point, a doctor would have to prescribe antibiotics to take care of these infections, but as these prescriptions will only handle the infections, your cold virus will be left untouched. During any cold of any severity, it’s important to get lots of rest and drink a lot of fluids; By being diligent on self-care, you can limit how long a cold can last. How Can I Get Rid Of My Cold? There isn’t a vaccine that can get rid of the cold forever, nor is there a preventative solution that you can get at your drug store. No, once you get a cold, you have to suffer through it until it goes through its cycle. So, the best remedy for any cold is to avoid getting one in the first place. It certainly seems like quite the chore given the fact that virtually everything you touch can lead to you getting sick. Start washing your hands frequently for at least 20 seconds: Washing your hands often can severely deter the cold virus from entering your system. Removing germs from your hands by washing them for at least 20 seconds with soap and water has shown to reduce the chances of getting sick dramatically. If soap is not an option, alcohol-based sanitizers do the trick nicely. Avoid placing your hands near your eyes, nose, and mouth too often: This may be difficult to manage, but if you feel the urge to touch your face, wash your hands first. The only way the cold virus can enter your body is through unwashed hands, so get into the habit now before the cold season is in full swing. Keep a reasonable distance from people who are sick: This one is a little harder to manage, but ultimately the best way to avoid getting sick is to stay away from people who are. What if you’re the one that’s sick? What should you do if you know you’ve caught a cold and you don’t want to spread it around? Luckily that’s simple. Stay at home while sick: It’s nice that you’re diligent, and you’re eager to keep your attendance record spot-on, but when you’re sick, staying home will do everyone at your job a favor. Avoid being too close to others: You don’t have to hide from the general public, but you can avoid touching and speaking too close to people. Doing this will limit the chances of your cold spreading. Move away from others before coughing or sneezing: Remember, this is the most guaranteed way that your cold will get onto others. Avoid directing your coughs and sneezes at other people and instead lead them into your shirt sleeve. Wash your hands often: When you cough or sneeze, washing your hands helps get rid of the virus that may have landed on you. Doing this also prevents you from leaving your cold on toys and other surfaces. Disinfect often: Disinfectant sprays and wipes are an excellent way to clean up after you’ve touched something like the phone or a keyboard. Disinfecting everyday items like these protect others from getting what you have. If you’re already sick, your primary focus should be rest and liquids. There are over-the-counter medications that can help relieve symptoms to help make you less miserable, but always be careful of the potential side effects of each drug before taking them. Remember, antibacterial medications do not kill off cold viruses, in fact, they could potentially hurt your chances of recovering from a bacterial infection if you use antibacterial medication too much. Let your doctor be the judge on whether they feel that it’s needed or not. Getting the cold virus is not the end of the world, even though at the time it may indeed feel like it. Having the knowledge to combat the issue, rather than suffer the consequences of ignorance, can aid you in preventing most colds while preparing you when you get them. You’ve learned the length of a cold, how you contract them, and even how to prevent the spread of this virus. The only way to stop spreading it is through knowledge and preparation. So how long do colds last? That’s up to you. If you’re preventative, you don’t have to worry about it. If you’re informed, you can take out what’s ailing you faster by taking care of yourself when you’re sick and not to add stress to the mix to lengthen it out. Three million people get sick annually by contracting a form of the cold virus. Knowing what you know now, are you prepared to be the exception this year?